You know how much I love PKM fabric. It is fabric I would design for myself if I had gumption, talent and Holly. Pam's new fabric is coming out at the end of the year and I'm super excited for her (and me). Pam is having a preview giveaway for some of her button card fabric. You gotta run over to Pam's blog and get in on this chance for button fabric. 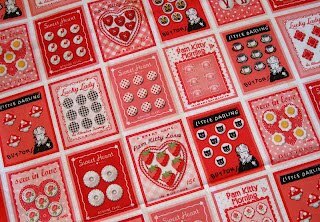 What could be cuter than vintage button cards set to fabric? Love it. It's such cute fabric, I've entered and won't be able to do much of anything else due to crossing my fingers in hopes of winning! thank you for letting us know about this giveaway -- the fabric is so sweet! You are right, Nanette! That is some super cute fabric. Going now. Thanks for the heads-up. I agree PKM's fabrics are just gorgeous! Very Cute Nanette. I can't wait to see what happens when you get your hands on that fabric! I ran right over. Easiest run ever. Not even out of breath. LOL! Such cute fabric! Thanks for the tip to enter. ...and me trying my hardest to resist buying new fabric!!! That is stinkin' cute for sure! !